Can we put together a bid that would potentially require 320 hours of 1 to 1 support for customers in four of our libraries for an eight week period between March and May 2017? It’s the kind of question that catches you off guard when you get an email when you are on leave. I was informed that in 2017 the Office of National Statistics (ONS) was planning to hold a test of the 2021 census, trialling various procedures and processes. 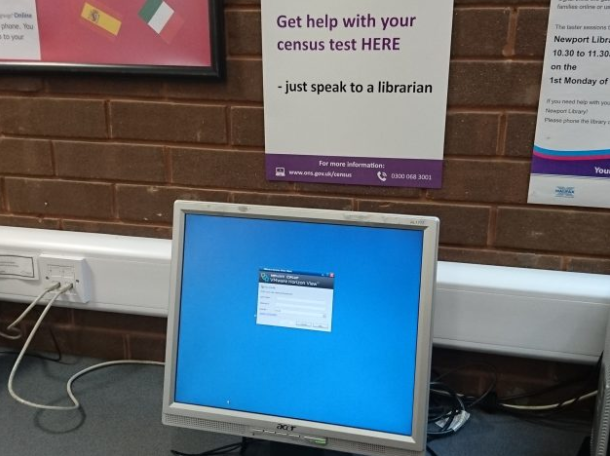 Was the Isle of Wight Library Service interested in testing the provision of assisted digital support? This was in late September 2016 and speed was of the essence. There were many quick phone calls to my colleagues in the library service and the council, and quick checks about specific details with the finance people. A phone call with an SCL colleague, a conversation with the SCL consultant who was helping to prepare the first bids, and the bid writing was underway. I knew the Isle of Wight was the first library service to be called on to bid for work under the Digital Training and Support Framework. We needed to be positive from the outset that we could achieve what we were being asked to do. Just as importantly, we wanted to ensure we were getting the process right, since this could have an effect on any future bids for other work around the country. One thing that was important from the outset was the quick turnaround of the information that was requested in order for the bid to be written and submitted. I was very aware of the limited staffing we have in our libraries and needed to ensure that we could have sufficient staff on call to provide the digital support should it be necessary. To achieve this, we insisted that we would need a system of pre-booked appointments to allow us to arrange for additional relief staff to be in place to meet the demand. This was being paid for by the money from the contract, so would incur no additional costs from the limited library service budget. There was a fixed fee for the staffing cost which was set out as part of SCL’s bid to be entered onto the framework. Training time had to be added for all staff, as did a management cost. ONS, who was the contracting organisation, had identified how much training would be required, so we based our calculations around this. An ONS requirement was that we had computers with internet access in the four towns the pilot was to be undertaken as well as having wifi available. The bid was successful; we were selected as the provider and met with the ONS team to get underway. It became very clear that 320 hours of 1 to 1 support might not actually be what was required, although this was the figure that the ONS has asked us to quote for, and the figure our costings had been based on. In reality, it appeared, the process might be much more flexible, although we would only know when it happened. We were told that 8,000 selected island households were being sent a letter from ONS asking them to take part in the census test and complete a form online. Although census trials were also taking place in other areas, the Isle of Wight was the only pilot that was specifically testing assisted digital provision, and therefore the only pilot where people could not request a printed form as an alternative. The letter specifically directed people to libraries if they needed help. Unlike with the full census, there was no statutory obligation to fill in the form. The letter sent to each participating household gave them a unique activation code. Residents had to go online – at home or in the library – go to a specific website, enter the code and fill in the form. As online services go, it was one of the easiest to manage. We were relieved to discover that there was no need for respondents to have an email address, which would have lengthened the work dramatically. We did have discussions with the council’s ICT team right at the very beginning, but they seemed equally positive that, as this was all web based, there would be no problem. ONS provided training for the service managers and provided all the materials we needed to make the process a success. They provided a video of someone filling in a census form as there was not at the time an offline training version. We used this video with all staff, taking them through all the questions and potential issues that we had already identified. “Is that it?” one member of staff said. “Yes!” was the response. Staff concerns were taken into account at every point in the process as we wanted to reassure them that the pilot would be manageable. We were prepared to put additional resources in if necessary to manage any appointments that may have been booked, but we needn’t have worried. Week one started off quite slowly, but then the sessions began to build. 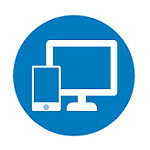 Some people did indeed need a booked session, but many others just needed to be put online, shown how to get to the website and started to complete their form. Some needed a little more support whilst others needed intensive handholding. It soon became clear that many customers did not actually want to pre-book a session, but preferred to get help straightaway. When staffing levels allowed, we tried to do this, but took bookings when this was not possible. We kept records for everything that the ONS required: how many bookings, how many drop in sessions, how many refusals (if any), etc. We also asked those completing the census online to complete an evaluation form. The ONS team were very supportive and, from the outset, it was clear that this was a joint learning process. We fed any issues back to them as they arose, and the ONS staff observed some sessions to see how residents responded to particular questions and the form itself. Some of the ONS staff carried out the assisted digital sessions themselves so they could see first-hand what problems people encountered. Two of our staff members had received letters to take part in the pilot. Their form-filling was observed by the ONS researcher and provided valuable feedback. We began to notice spikes of activity which followed the reminder letters which were sent by ONS to residents who had not yet completed forms; this did help us to plan accordingly. The feedback we were getting from the evaluation forms was incredibly positive about the library service’s involvement. People felt that staff supported them well, and a number said they would use the library again. The majority of people that needed help were elderly. This was not surprising to library staff who are used to assisting people online. Overall, we had 139 people who needed digital assistance. It was important, however, to know from the outset that we could have helped all 320 as was the original expectation. It was interesting to note that we were dealing with two separate sections of ONS: the procurement people and the delivery folk. Expectations were very different between the two sections, but we had to be sure we could have met the demands as our costings were based on this figure. It was great to see so many new people coming into the library. We wanted to ensure that there no barriers in the way in the form of library rules and procedures. We used the letter from ONS as proof of address and made sure that all staff were aware of this and knew to sign the customers on to the Public Network computers without any additional form-filling. The whole process from delivery onwards was very straightforward and didn’t raise any real concerns. Our staff found it a very straightforward process to help people and could often manage “drop ins” as well as sessions that had been booked. We certainly could not have met the needs of 320 hours of 1 to 1 sessions without some kind of booking system. We always try to help people wherever we can, but this additional workload does need to be planned for. Would we bid again? Without doubt - but we would use the learning from this pilot to inform how we progressed. Lessons for other services – be prepared for quick turnaround of information at the beginning of the process and make sure that the expectations are the right ones. Make sure the staff are trained and supported throughout, and ensure you have bought yourselves enough management time as it is surprising how much time is taken in planning and feedback sessions with the contracting organisation.